All these traditions are clearly to be found in Homer, Virgil, and other Greek and Latin authors; they were doubtless originally derived from the Hebrews, or rather the Egyptians, from whom the Greeks took their religion, which they arranged to their own taste. The Hebrews speak of the Rephaims, of the impious giants "who groan under the waters." Solomon says that the wicked shall go down to the abyss, or hell, with the Rephaims. Isaiah, describing the arrival of the King of Babylon in hell, says that "the giants have raised themselves up to meet him with honor, and have said unto him, thou has been pierced with wounds even as we are; thy pride has been precipitated into hell. Thy bed shall be of rottenness, and thy covering of worms." Ezekiel describes in the same manner the descent of the King of Assyria into hell—"In the day that Ahasuerus went down into hell, I commanded a general mourning; for him I closed up the abyss, and arrested the course of the waters. You are at last brought down to the bottom of the earth with the trees of Eden; you will rest there with all those who have been killed by the sword; there is Pharaoh with all his host," &c. In the Gospel, there is a great gulf between the bosom of Abraham and the abode of the bad rich man, and of those who resemble him. The Egyptians called Amenthés, that is to say, "he who receives and gives," what the Greeks named Hades, or hell, or the kingdom of Hades, or Pluto. They believed that Amenthés received the souls of men when they died, and restored them to them when they returned to the world; that when a man died, his soul passed into the body of some other animal by metempsychosis; first of all into a terrestrial animal, then into one that was aquatic, afterwards into the body of a bird, and lastly, after having animated all sorts of animals, he returned at the end of three thousand years to the body of a man. It is from the Egyptians that Orpheus, Homer, and the other Greeks derived the idea of the immortality of the soul, as well as the cave of the Nymphs described by Homer, who says there are two gates, the one to the north, through which the soul enters the cavern, and the other to the south, by which they leave the nymphic abode. A certain Thespisius, a native of Soloe in Cilicia, well known to Plutarch, having passed a great part of his life in debauchery, and ruined himself entirely, in order to gain a livelihood lent himself to everything that was bad, and contrived to amass money. Having sent to consult the oracle of Amphilochus, he received for answer, that his affairs would go on better after his death. A short time after, he fell from the top of his house, broke his neck, and died. Three days after, when they were about to perform the funeral obsequies, he came to life again, and changed his way of life so greatly that there was not in Cilicia a worthier or more pious man than himself. As they asked him the reason of such a change, he said that at the moment of his fall he felt the same as a pilot who is thrown back from the top of the helm into the sea; after which, his soul was sensible of being raised as high as the stars, of which he admired the immense size and admirable luster; that the souls once out of the body rise into the air, and are enclosed in a kind of globe, or inflamed vortex, whence having escaped, some rise on high with incredible rapidity, while others whirl about the air, and are thrown in divers directions, sometimes up and sometimes down. The greater part appeared to him very much perplexed, and uttered groans and frightful wailings; others, but in a less number, rose and rejoiced with their fellows. At last he learnt that Adrastia, the daughter of Jupiter and Necessity, left nothing unpunished, and that she treated every one according to their merit. He then details all he saw at full length, and relates the various punishments with which the bad are tormented in the next world. He adds that a man of his acquaintance said to him, "You are not dead, but by God's permission your soul is come into this place, and has left your body with all its faculties." At last he was sent back into his body as through a channel, and urged on by an impetuous breeze. We may make two reflections on this recital; the first on this soul, which quits its body for three days and then comes back to reanimate it; the second, on the certainty of the oracle, which promised Thespisius a happier life when he should be dead. In the Sicilian war between Caesar and Pompey, Gabienus, commander of Caesar's fleet, having been taken, was beheaded by order of Pompey. He remained all day on the sea-shore, his head only held on to his body by a fillet. Towards evening he begged that Pompey or some of his people might come to him, because he came from the shades, and he had things of consequence to impart to him. Pompey sent to him several of his friends, to whom Gabienus declared that the gods of the infernal regions favored the cause and the party of Pompey, and that he would succeed according to his wishes; that he was ordered to announce this, "and as a proof of the truth of what I say, I must die directly," which happened. 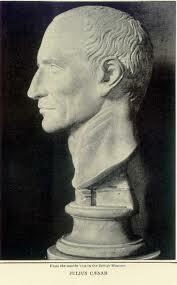 But we do not see that Pompey's party succeeded; we know, on the contrary, that it fell, and Caesar was victorious. But the God of the infernal regions, that is to say, the devil, found it very good for him, since it sent him so many unhappy victims of revenge and ambition.